Trelleborg’s marine systems operation was involved in two milestone events in just one week earlier this year, after one of the biggest ships ever constructed set sail and one of the largest offshore facilities was launched utilising its SafePilot solution. The pilots navigating Orient Overseas Container Line (OOCL) Hong Kong and Prelude, Shell’s floating liquefied natural gas (FLNG) facility, both relied on SafePilot technology to ensure safe navigation through tight and complex channels in two ports around the world. 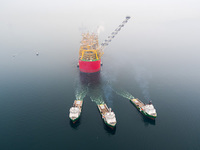 After leaving its South Korean shipyard, Shell’s Prelude FLNG facility headed to the natural-gas fields off Australia’s northwest coast, where it is currently chained to the ocean floor. The journey marks a major milestone for the project, setting it up to begin producing LNG for customers globally. Extracting and gasifying LNG from a site in North West Australia, Prelude is 488 meters long, 74 meters wide, and made with more than 260,000 tons of steel. 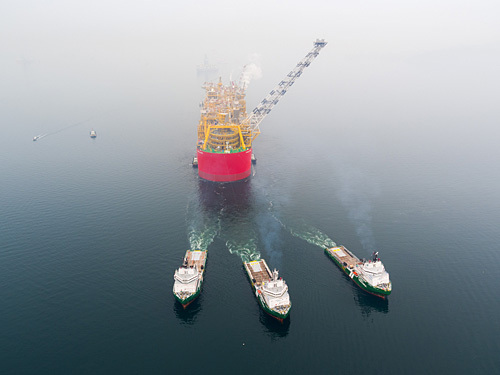 Prelude is fitted with Trelleborg’s SafePilot solution to allow it the ability to closely monitor the relative motion of the FLNG and carrier during approach, in both sideways and tandem mooring configurations. The offshore operation requires a precision approach, monitoring and mooring software for the offshore oil and gas industry. The pilot, master, tug operator and control room must all have access to real-time, accurate and independent picture of the relative positions and movement between the different objects and tankers in the operation. Trelleborg’s offshore software allows the ability to view all objects and shuttle tankers together, on a single display. In the same week, the largest container ship in the world was guided safely into port at Felixstowe on its first ever trip to the UK. The OOCL Hong Kong is as long as four football pitches and has a deadweight tonnage of around 190,000 metric tonnes. “Two senior Harwich Haven Authority pilots safely navigated the OOCL Hong Kong on her inaugural visit to Port of Felixstowe in June 2017,” says Mike Dunn, Harbour Master at Harwich Haven Authority.